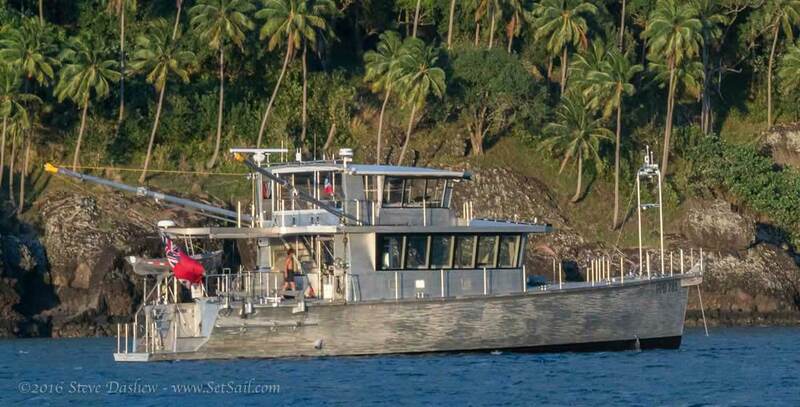 …and we thought some comments on what we have learned in the initial 10,000 nautical miles of cruising aboard FPB 78-1 Cochise might be of interest. Although Cochise has a range in excess of 5,500 NM under these conditions, and the current voyage distance is easily within Cochise’s range, we are making use of a few simple tools which allow us to precisely analyze and manage fuel data for this trip, as well as record it for future use. This is a long and detailed post, based totally on real world numbers. Even though your own situation will probably be different, the process we are using has universally applicable principles. We start off with the numbers, then we will look at what can be done to improve efficiency, followed by a few words on weather tactics. When looking at the following numbers, keep in mind that they are for a large, relatively high windage yacht, traveling for the the most part directly into the wind and seas. During much of the passage there is also a substantial current against us, varying between .5 and 1.5 knots. After entering this data into our paper log, we then transfer it to the spreadsheet. At a minimum this is done daily. But if there is a major change in conditions, we will capture it more often for future reference. 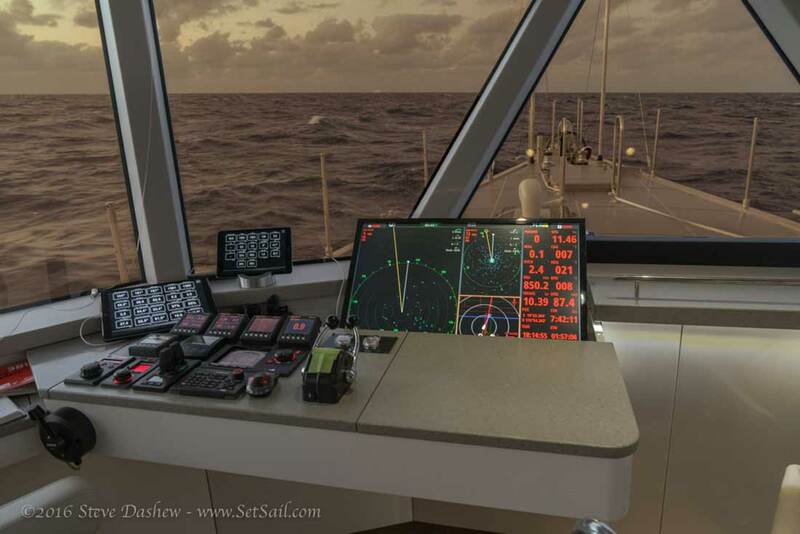 With a database of real world conditions on which to draw, we can make intelligent assessments of potential passages, before heading out, and understand where we stand while underway. Without it, say with just smooth water data or marketing-based fuel consumption propaganda, one needs to add healthy doses of safety factor to the calculations, to make sure lack of accurate information doesn’t catch you short mid-ocean. What we are after is the total fuel burned, inclusive of electric and hydraulic requirements. Since we do not need to run a generator underway – the engine driven alternators each have a five kW capacity – keeping total score is simple. Likewise, during passaging stabilizer and rudder drag can be substantial, not to mention windage and rough water wave drags. For the fuel burn data to be meaningful it has to include all of these elements. 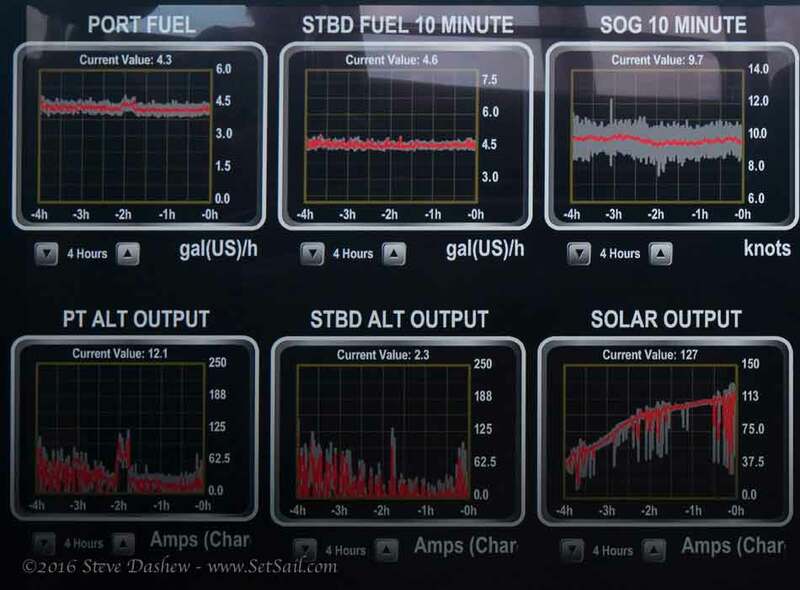 Since this voyage has been almost entirely uphill to date, in a warm environment requiring air conditioning, the data we are capturing is worst case scenario in terms of fuel consumption. Speaking of worst case, take a look at the numbers in the photo above. These are high on fuel burn and slow on speed, in spite of the DC load being carried mainly by the solar array during the middle of the day. Butting heads with the trade winds generates these kinds of numbers. Better to know ahead than have to learn the hard way from a fuel shortage. Time period for the data (subtract previous engine hour reading from present engine hours): 23.6 hours. Distance traveled (subtracting the previous GPS log distance from the present): 242 NM. 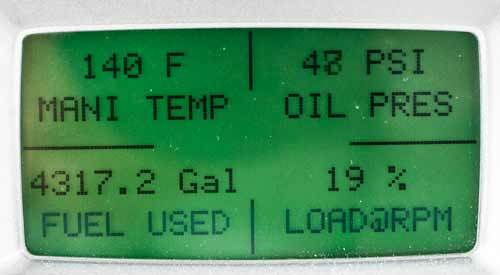 Fuel burned (we add the two total fuel consumed values from the Deere displays, and then subtract the prior period’s readings): 213.1 US gallons. Total fuel consumed for the passage or since last fill-up (the difference between the beginning of passage reading and present): 1719.7 USG. Fuel left in tanks (assuming full tanks at beginning of voyage, subtract total fuel burned this passage from usable fuel capacity): 3053.2 USG. Average speed over ground (SOG) for the period (divide distance traveled by time): 10.25 knots. The speed length ratio, important because usually the higher the SLR the less efficient you are (take the square root of the waterline length and divide it into the average speed): 1.13. Gallons/liters per nautical mile (NM) is the value we use the most. Derived from dividing the fuel burned by the distance covered–for this period .88 G/NM. We find this falls into a range +/- 12% of an average value for a passage. Multiplying this times distance left gives us the fuel required for the total of all loads and drags, which can then be compared to fuel on hand. It is worth repeating that this value is all inclusive–folding rough water, windage, generator, hydraulic, dirty prop/bottom into one as a single value. The range since leaving Raiatea has been .736 to .978 G/NM. Fuel left on board at end of voyage, at the present burn rate, is arrived at by multiplying burn rate times distance-to-go, and subtracting this from available fuel. Right now this looks like we will have 667 USG left on board when we reach Panama. Maximum burn rate available with remaining fuel is derived by dividing distance-to-go into remaining fuel or 1.13 G/NM. Notice this is a far higher figure than anything that would normally be required. It does, however, give us a handle on how much we could speed up, if we wanted to. Another way of looking at this is to ask the question: how much fuel do we finish with if we go faster or slower? Because we are fighting significant current, 1.5 knots an hour against us over the last 36 hours, these numbers are skewed toward the negative. However, we expect that in another 24 hours the currents will be much reduced, and it is more efficient overall to go faster now, burning extra fuel in the process, which gets us out of the adverse current as quickly as possible, and then slow down if needed when we get into more favorable conditions in a day or two. We double-check the overall consumption data in several ways. First, there is a fuel flow meter in the feed line from the hull tanks to the day tank that is logged. Next, we look at burn rate average per hour times total hours since departure, and then G/NM times miles traveled at this point. Both the latter variables are judgment calls. In this case, this morning’s figures are within a couple percent of each other. Finally, we do not use the actual remaining fuel figure in our what-if scenarios. Rather, we deduct a fudge factor from remaining fuel, just in case. We polish the props and wipe the bottom before departure. At the start of the trip and during the passage longitudinal trim is monitored. 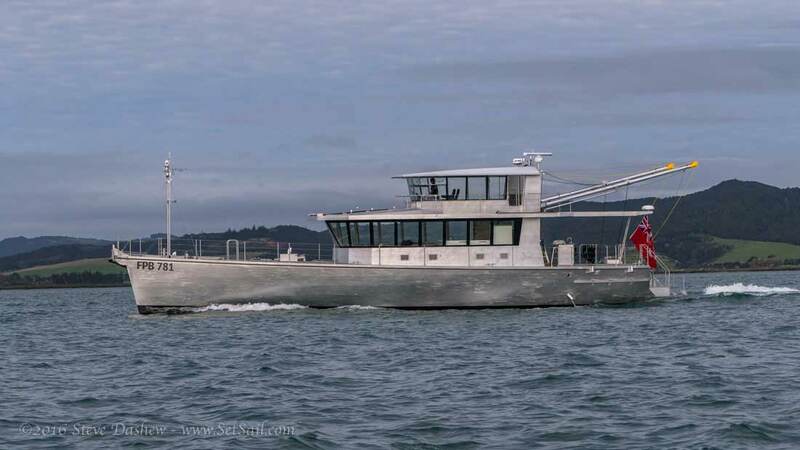 We know from sea trial data that Cochise likes a slight stern-down trim. Stabilizer and rudder settings are monitored to make sure they are doing the minimum required to steer the boat and keep us comfortable. We allow the boat to heel a few degrees, and trim with fuel to offset windage heel rather than just let the stabilizers level the boat. During much of the trip, with the wind from the starboard side, the starboard side fuel trim tank is kept filled and the port side empty. Autopilot dead band is kept as wide as practical. Booms are positioned for minimum windage upwind and when reaching, and for maximum windage when downwind. The air conditioning system is managed to keep us comfortable, but not run excessively. The natural and powered ventilation, coupled with extra hull and deck insulation mean that right now we do not even need air conditioning. The solar array carries a large percentage of daytime energy needs. This saves fuel and alternators and related component wear. We minimize the extra water carried until end of the voyage. We keep sufficient water for the passage on hand in case the watermaker fails, and then add as required on a daily basis. Another part of this fuel deduction process deals with weather. Given the length of the voyage and time frame – 18 to 23 days – it is impossible to know with any degree of confidence the weather conditions in detail for the entire passage. So we divide the route into segments, make assumptions about each, and then update as we move along and get real world results and/or more reliable predictions. For this trip it meant starting slow, running at 1400 RPM and targeting 9.3-9.7 knots. We have now pushed this to 1600 RPM and 10.0-10.7 knots. We expect the last 1,000 NM to have wind behind us, giving us the option of slowing to save substantially on burn rate, maintaining speed while reducing fuel burn, or holding fuel burn steady and going faster. If the luxury of such a favorable fuel capacity/burn rate/voyage scenario is lacking, there are many things you can do to improve the situation. This starts with polishing the props and wiping the bottom. The props are worth five to ten percent alone. Next is maintaining an optimized fore and aft trim. As previously mentioned, slowing down will yield benefits, as will using this as a form of heaving-to, delaying most of the trip until conditions improve. Managing electrical needs plays a part. Air conditioning alone costs between a half and three quarters of a gallon per hour. The fuel burn per nautical mile is used in all our moment-to-moment decisions on speed and heading. We always have a target number that is the maximum burn rate goal. At present, the budget is .9 gallons per NM. A week later and the conditions have changed for the better as forecast. We have current helping us a bit, and the headwind has been exchanged for a lovely tail wind. 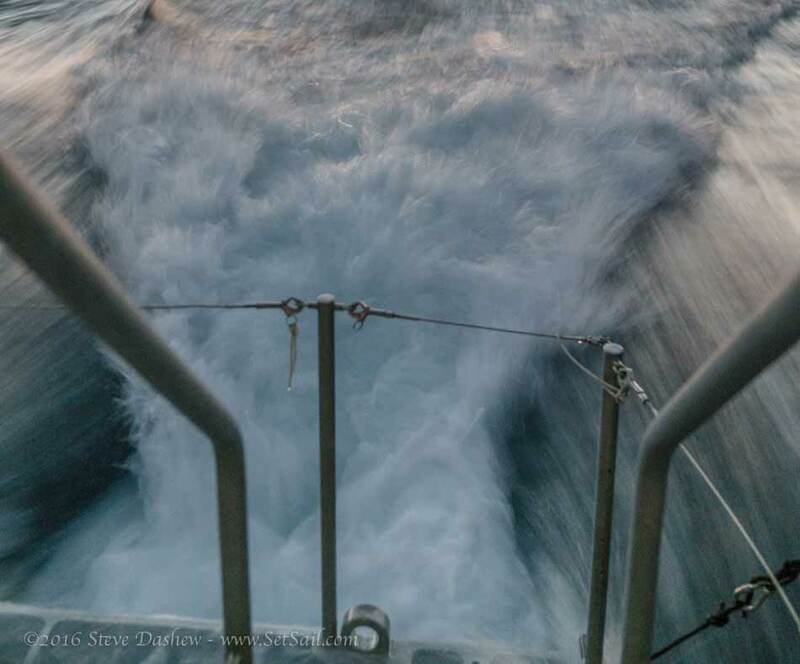 It is light, eight to 12 knots, but sufficient for a slight push. With a chunk of the fuel burned off and the boat lighter, we are doing short surfs. Boat speed improves to an average of 10.67 knots, fuel burn is 9.0 gallons per hour, and the G/NM figure stands at .847 at a speed length ratio of 1.17. We carry these positive conditions to Punta Mala, whereupon the wind switches back on the nose until arrival. Passage length was 4,693 nautical miles. Cochise consumed 4,067 gallons of diesel for the passage. Net engine hours were 469.5. Average speed was 9.996 knots (we missed an even 10 knots by less than an hour). Cochise burned 8.663 gallons per hour. Average burn per nautical miles was .8667 gallons. We had 704.9 gallons of usable fuel left aboard. Safety factor with fuel left was 17.3% when compared to the fuel required for the passage. We estimate a net loss for the entire passage of .7 knots per hour. We would not use a 17% factor of safety in passage planning. Reducing speed by a knot would double this to 35%, a more acceptable figure. We could start out faster, as was the case for this passage, and then slow down if required once we had a feel for the conditions. So how accurate is all this new and scientific approach in the end? Although we have sufficient fuel left in the tanks for the passage to Florida, we want a margin in case we get to messing with a late season tropical weather event, and we also want to verify the accuracy of the John Deere burn figures. So we have moved the fuel spread out throughout our five tanks to the center tank, and have filled just this tank to see if we actually have left what the Powerview panel consumption figures indicate. And the answer: We predicted the tank would take 631.6 gallons. We loaded 584.6 gallons into the center tank. That is a difference of 47 gallons or almost exactly one percent. The difference could easily have been how the tanks were filled each time. That’s it. From Panama in the wet season, we bid you adios. This entry was posted on Friday, November 18th, 2016 at 1:46 pm and is filed under Dashew Logs, FPB 78, The Logs. Both comments and pings are currently closed. Dear Steve, thank you for this very informative and extensive – I would call it a scientific – analysis. You mentioned the Deere engine displays. My questions is 1) That “FUEL USED” is it actually MEASURED somewhere in the engine or is it a CALCULATED value from some tables in the electronic fuel injection unit? 2) Does the Deere engine also display directly a “FUEL FLOW” in gallons/hour or liters/hour? Best regards. Our understanding is that the fuel consumed is calculated by the ECU based on what it is delivering. Seems to be within a percent. We also get fuel flow which we show at 10 seconds and ten minute averages on the N2K system. Novice question, (sorry) but from what you have described of your big red 5kw alternator’s you can vary the load they place on the engines, and you can do that independent of engine rpm and boat speed. Said another way, if the engines are turning 1,400 RPM and you are doing 9 knots, from what you describe, you can increase or decrease how much fuel burn goes towards the alternator’s without altering that 1,400 RPM and 9 knots of boat speed. Is there some way to engage and disengage the altenator’s mechanically? If not, and they are bolted to a fixed bracket and belted onto the PTO (as it looks like in some of the engine room pictures) wouldn’t a set engine RPM generate a set amount of electricity and burn a set amount of fuel? Or do they have some sort of internal clutch? Alternator fields are switched on or off. This eliminated them from using power. Interesting and informative article! Have been doing similar calculations, albeit on shorter trips. Still struggling with Simrad settings to get it to show same info on screens. Hence the manual back up. May i ask how you measure fuel tank content. With non-linear tanks, as I am sure Cochise has, measurements remain in accurate. Right now we do no have a tank measurement system we trust, But we can verify quantity by moving fuel through our polishing/transfer system and checking the in line meter. Not being a power guy (yet), I am unfamiliar with the real world power required by the stabilizers. I was thinking that extending the booms out even going upwind should help reduce rolling, which would reduce the stabilizer workload. And that might be enough to offset the extra drag while reducing the workload on a piece of equipment that I assume is less reliable than a modern diesel engine. I would be interested to know if you have done any testing along these lines. And if the question shows a huge lack of knowledge about power boat operations, just tell me to go back to trimming my sails. We have tested all sorts of configurations and extending the booms does lower the roll period. But the windage appears to offset any savings in induced stabilizer drag. Yout pioneering efforts will perhaps one day be recognized as a keystone in the development of an equally capable solar powered boat.